DESIGN 101: WINDOW TREATMENTS - HOW TO MEASURE! So far this month we've reviewed different window treatment styles, fabrics, and details. We've shown you our favorite window treatment combinations and talked about what to do with tricky windows. If you missed any of our posts, just check out Design 101 for details! Now that you've figured out what window treatments are right for your home, and you've selected your fabrics, you'll need to have an idea about how to measure! See below for our top tips! 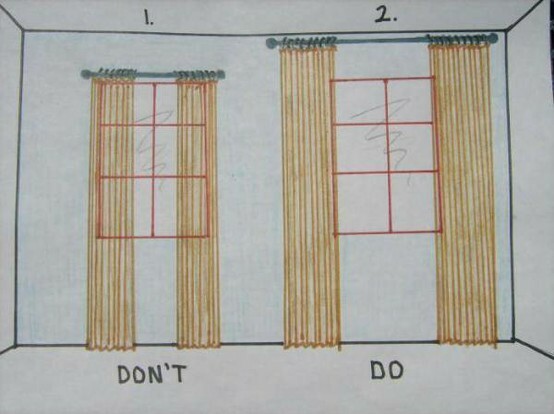 Honey + Fitz provides us with this great drawing showing how to install drapery. 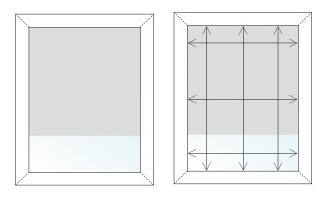 In the illustration, both windows are the same size. But notice how much larger the window on the right appears! We always suggest hanging drapery as close to the ceiling as possible and covering as little of the window trim as possible. 1. Measure from the top of the drapery rod to where the drapes will fall on the floor. Remember that we recommend drapery have at least a slight break on the floor, but you can also add a dramatic puddle detail. This measurement will be "A". 2. Measure from one end of your drapery rod to the other end to determine the total width. Your rod will likely extend slightly beyond the window frame, so this measurement is more accurate than measuring the window itself. This will be measurement "B". 3. Add 6-8" total to the length measurement ("A") if you will need to add seams, or if you're using drapery rings or a rod pocket as your header. For example, if you want 102" drapes, your material will need to be 110" long. This will be measurement "C" ("A" + 6-8 = "C"). 4. Multiply the width measurement"B" by the fullness you want. 2.5 fullness is typical for drapery, but if you want a less full look consider a fullness of 1.5. For stationary drapery panels, use a fullness of 1.5. Next, add 2" to this number to account for seams. For example, if your width is 40", your material will need to add up to 102". This will be measurement "D" (("B" x 2.5) +2 = "D"). 5. Divide your final length measurement ("C") by 36 to determine the required yardage (a yard is 36"). For example, if you need 110" of material, you will need just over 3 yards of material. 6. Divide your final width measurement ("D") by the width of the fabric you are buying. Most fabric is sold at 54" wide, but you can find fabric sold at various widths. 7. Multiply the length of each panel by the amount of panels needed to get your total yardage. This diagram by Imagine's blog offers a terrific visual for how to measure yardage for drapery panels. 1. Measure the inside of your window in 3 spots: the top, the middle, and the bottom. Use the smallest measurement as the width of the window. For fabrication, you will need to deduct 3/8" to 1/2" from the width. 2. Measure the height of your window in 3 spots: the left, the middle, and the right side. Use the largest measurement as the length of the window. 3. Determine whether or not you will use a standard string cord on a cleat or a continuous loop chain cord. 1. Measure the width of your window frame, and add 2-3" total (1-1.5" each side) to prevent light seepage. 2. Measure the height of your window frame from the top of the area you wish to cover to the bottom of the area you wish to cover. Keep in mind that when raised, a roman shade will still hang about 8-9" long. Therefore, if you want to clear the window area when the shade is raised, consider raising the height of the overall shade placement. 4. If you are going to use a valance, which we often do with outside mounted roman shades, the valance should be 1" wider than the shade. Thanks to The Shade Store for the easy-to-read measurement drawings! If you have questions about how to measure for your window treatments, they are a great resource for measurement instructions. Do you have any other window measurement questions? Let us know, we love to hear form you! Up next week: Window Treatment Care & Maintenance!